Put your traffic team in control with a smart tool to manage incoming ads and content. Traffic Management is the ultimate trafficking assistant, and you can start for free. Manage your incoming ads the easy way. Traffic Management aggregates your incoming content, works with all media and integrates seamlessly with the workflows of any broadcaster, media agency or publisher. Receive, manage and re-distribute linear and digital video from brands, agencies and suppliers. Receive, manage and re-distribute linear and digital print content from brands, agencies and suppliers. Aggregate content from every source into a central place automatically. Move quickly, with video preview proxies, team-based filters and smart production integrations. Traffic Management is full of team-friendly features designed to simplify broadcast workflows. Expedite your publishing process with online and desktop tools for sorting, routing, renaming and transcoding print content on the fly. Traffic Management is designed to fit right into your existing digital and print workflows. Give customers access to your latest media sizes and spec data with one click. Every ad received through Traffic Management is optimised to your precise specification. Traffic Management gets your team working more efficiently. Every ad arrives in your own unique, production-ready, format. There's no chasing, rejects or incorrect ad copy, and files are tracked, audited, and visible to your team whenever they need them. Take your workflow to the next level. Media Automation aggregates your ads, convert them to digital, and automates just about any process in your media workflow, completely handsfree. Traffic Management is everything broadcast and print teams need to manage incoming content from every party. 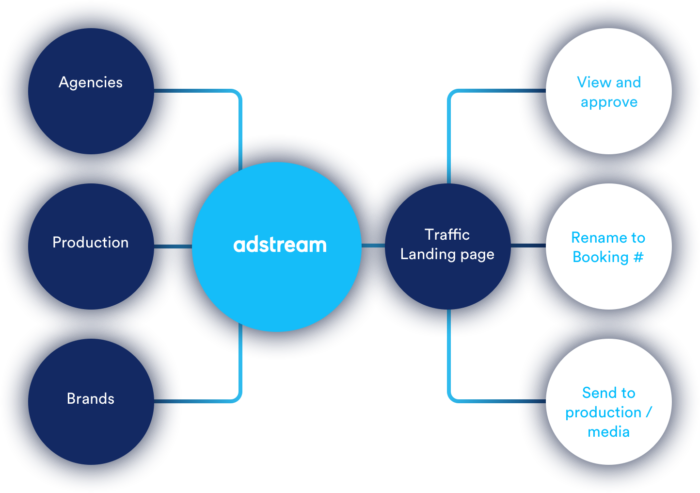 At Adstream, our global teams work together to get your ads to market 24/7 to ensure your campaign gets to market faster than anyone else.